Whether you are looking for a structured day leading to an award or a team building session, we are the ideal venue for your School or Group event. Give us a call to arrange a day (or half day) tailored to meet your needs. Our sessions can be for fun or combined with a learning objective, the possibilities are only limited by the imagination. Use outdoor activities as a learning environment that develops effective group communication. 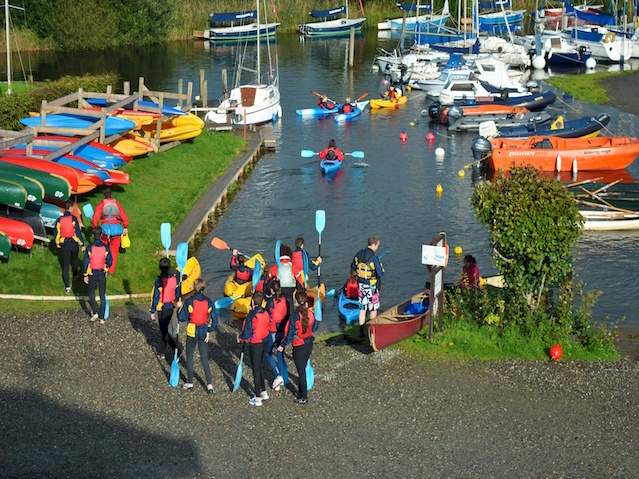 Work towards a National Governing Body Award, RYA or BCU, or a GCSE module. Full days, half days or several days of activity sessions can be designed around your group and your aims. 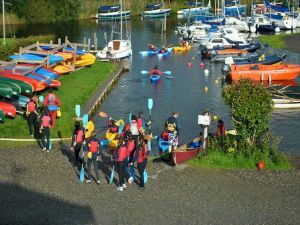 Group Canoe – our group canoes will each seat 8 -12 people and can be used for journeys on the lake, time trials or races. Introduction to Sailing or Windsurfing – a fun exciting session and a great way to develop an interest in a new sport. Raft Building – a great session where the group is split into teams, each team builds a raft from the equipment provided then races against the other teams! Ghyll Scrambling (Canyoning) – a great team activity for schools and youth groups promoting group communication skills. We normally work in groups with a maximum of 8 people. You can book in half day or full day sessions. Our sessions run from 9:30 – 12:30 and 13:30 – 16:30. Your own transport will be needed for off site activities, such as Ghyll Scrambling. All prices are based on activity groups of a maximum 8 people to 1 instructor. (minimum of 6 to 1 instructor) This enhances quality and safety. One free staff place per 15 people paid. We provide wetsuits, buoyancy aids, spray tops, helmets and other safety equipment as required. You will need to bring footwear such as wetsuit boots or old training shoes. We also have group prices for adults, please call us at the office for a quote. This password protected area contains downloadable PDFs for schools and youth groups, please contact the marina for the password.